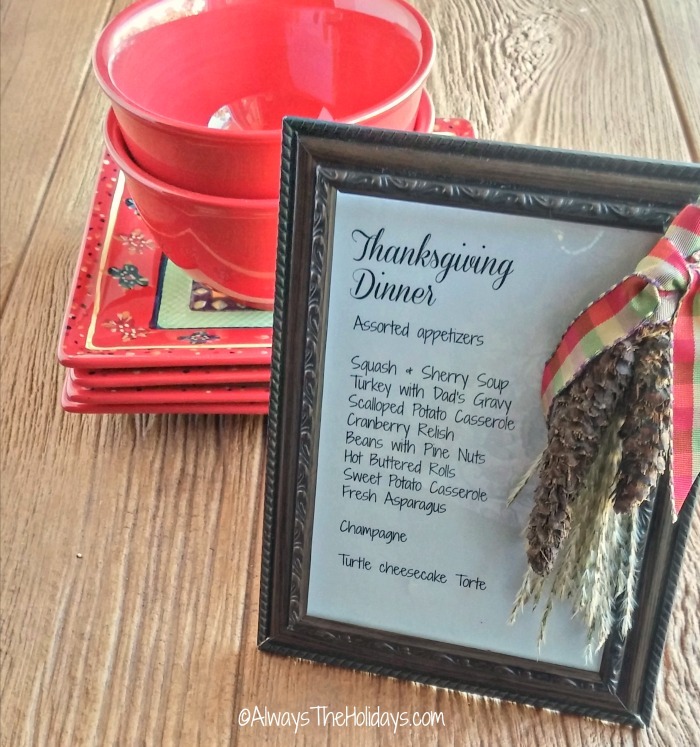 Let your holiday guests know what will be on the menu with this Thanksgiving dinner menu plaque. Thanksgiving is such a wonderful time to gather your loved ones and make a meal from your heart that you know they will love. Let your dinner guests know what is on the menu with this stylish Thanksgiving dinner menu plaque. It is easy to put together and makes use of things in your garden. There are loads of ways to use a menu on a formal table. You can add it to a chalkboard and have it standing nearby but that is sort of a bistro look and not what I was going for. Just printing it out on card stock and putting it on the table was too “restauranty” for me. So I came up with the idea of putting it in a picture frame. What a lovely addition this would make to a Thanksgiving table! It is both decorative and functional. With all the food on a normal Thanksgiving menu, it will also make it easy to for family to pace themselves, if they know what is coming in the next course~ It gives the table a very professional look and could not be easier to make. Just print out your menu on card stock and add to a picture frame. Greenery from the garden and a pretty fall ribbon complete the project. You can find the whole photo tutorial on my main site, The Gardening Cook with step by step instructions.